Why is The Journey significant for Nohre & Co? It is evidence of the firm’s direct, hands-on personal experience with creating a vision for an organization, meeting the challenges involved in realizing that vision, and continuing the organization’s long term growth as a profitable and successful part of the local business community. 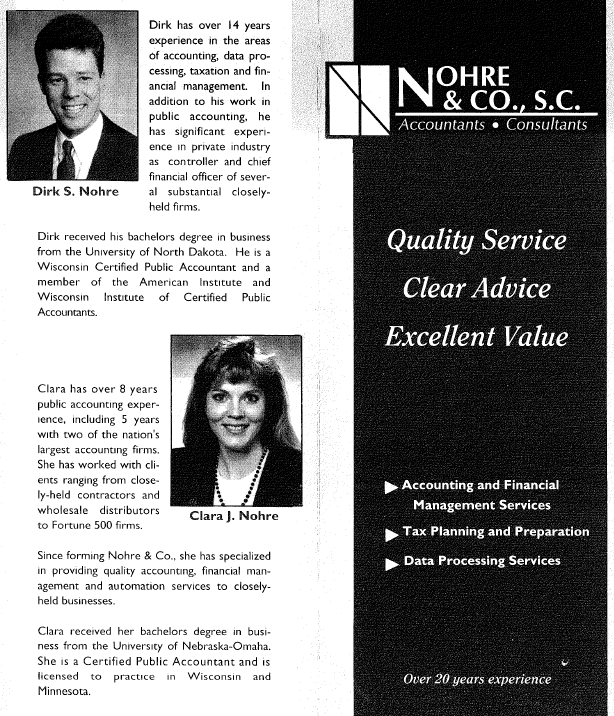 Nohre & Co was established in the fall of 1992 when Dirk and Clara Nohre left Milwaukee and chose Eau Claire, Wisconsin, as the perfect environment to start a business and raise their growing family. Dirk had been the chief financial officer or vice president of finance for closely-held businesses charged with organizational profitability, but the new firm would provide his first public accounting experience. Clara had prior public accounting experience with two large firms, but neither of them had any sales or prior ownership experience. They had assembled $50,000 to launch their firm which began as a traditional accounting practice operating out of a spare bedroom in their home on Ohm Avenue. They offered basic income tax and accounting services to local individuals and small businesses. Their campaign was working. As of year end 1993, the firm had almost 50 individual and small business clients and had grown to the point that operating out of their home had become an unsatisfactory approach. That was good news: clients, revenue, and momentum. BUT, growth created new challenges. The $50,000 of seed capital, intended to last during a 2-3 year start-up phase, was gone. The need to rent and equip professional office space was paramount. The reality: sales were up, but not by as much as expenses. Their success had led them to a financial crossroad. As every entrepreneur knows, the pressure (both operational and financial) as a new business grows, can be almost unbearable. By the fall of 1993, Dirk and Clara had spent their entire life savings on the new firm. 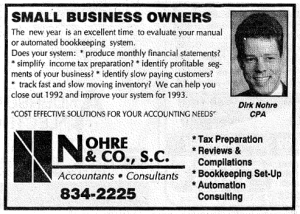 They were still virtually newcomers to the Eau Claire business community, but Dirk had a good banking relationship back in Milwaukee, so they prepared a loan request for $25,000. The response from the Milwaukee banker was that they would have to “boot-strap it.” Dirk and Clara were unfamiliar with that term at the time. Since they had not yet built banking connections locally, they racked their brains for people that would loan money to a fledgling business. A former employer in Phoenix, Arizona (from 10 years earlier) was their best prospect. Dirk called him, gave him the background and asked for a loan of $25,000 to keep the new business going. He was met with silence. The former employer told Dirk he would call him back with his answer. The loan came through and gave the new firm the anchor they needed. It also gave them time to develop a local bank relationship. 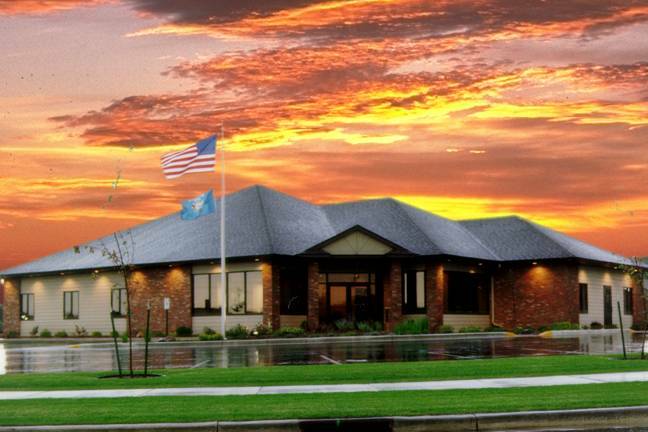 This put them in business for another six months, during which time they met Dean Olson, President of Charter Bank. That bank relationship provided the capital Nohre & Co would need for its growth during the next 10 years. The strategic plan of the firm calls for steady growth. The firm has never taken the “assembly line approach.” Rather, the firms’ service approach involves building a relationship between each client and the professional assigned to that client. As a result, organizational growth has been steady, but controlled. Nohre & Co is currently a staff of 12 full-time professionals. The firm is continually seeking proactive professionals to round out and join its team of advisors. Looking to the future, Nohre & Co also added its first partner in January 2014, Stuart Cooper. Stuart, a member of the firm since 2002, heads up the tax services department. The basic tenet of the Nohre organization is that there is no substitute for hard work, fair prices, and good service. The firm has positioned itself to compete successfully by adopting the following principles. We Are Independent. The firm has chosen to be a traditional hourly-fee practice, allowing the professionals to remain completely independent in their advice. No products are sold, no referral fees are accepted. Only unbiased independent advice. We Are Proactive. The firm offers a unique proactive ‘Client Service Review’ process that identifies the needs of each client and then triggers periodic service reviews with each client. The firm utilizes a series of self-developed service checklists to assist in providing consistent proactive service, advice, and follow up. We Are Client/Industry-Specific. The firm has developed a ‘Best Practices Profit Model’ for each industry served, identifying the critical financial indicators of that industry, and working with the client to incorporate these indicators into the day-to-day accounting and management reporting. Over the years the firm has developed industry specialties within the traditional accounting service field. Specialties have been developed in manufacturing and distribution, construction and real estate development, and the insurance industry. As the specialties have developed, the firm’s client base has expanded geographically. Currently about 60% of the firm’s revenues are generated by clients within the Chippewa Valley, with the balance generated outside the area. From the first day of operation in that spare bedroom, Dirk and Clara Nohre have continued their hands-on involvement in Nohre & Co: generating new customers, managing the ongoing-operations, and providing a significant amount of direct customer service. And they have chosen and trained their team members to use this same approach. 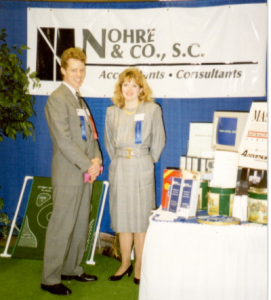 Nohre & Co looks for WIN-WIN relationships with other businesses and their owners, locally and nationally, within their specialty areas. They look forward to discussing your business challenges and providing you and your business with BETTER ADVICE.